Maybe I should give this philosophy a try. Let me get this straight. My mind has created duality which includes space, time, form etc. Thus I take it that, since my mind created all of this, that it can also undo it. Let me give this a try. I am typing on many keys, but my mind is playing a trick on me. Stop it mind! Ah, yes. Now I am only typing on one key. This is much easier. I think I am writing to many people, but this is another trick of my mind. OK mind, stop it. Let me see the oneness. Wow. It’s working. Paul just disappeared! Whoops, there goes Ed and Zia, Rob, Glenys, Rick. Man look at them go. I never realized that you guys were just a part of my mind. You’re all gone now except for Xavier. Man is he putting up a fight, but he’s finally starting to fade. This is kind of disappointing. All this time I thought I was writing to a group; now I have only myself to write to with only one key. Now I look around me. There is still a lot of tricky duality present. OK mind turn off the rest of this illusion. There goes my TV, my phone, my computer and now my chair – whoops, that hurt. I’ll make the floor go next and now my house. Now I’m just standing on the ground looking at the sky and my wife is angry at me for making this happen. I forgot about her. There she goes. Now she’s gone there will be no more complaints from her. Now there’s still the earth and the rest of the universe. These are more than one so my mind must have created them too. Earth, disappear. WOW!!! This is weird. I’m just a dualistic body floating in space. I’m on a roll though so I think I’ll see where this leads me. Some say it’s supposed to be eternal bliss. OK stars and sun you’re next! Which is going to go? My mind essence or the void? Wait! Am I crazy? Do I want to be reduced to the nothingness of a void just to be one? No way. Mind get busy and create everything again just as it was. And it came to pass that JJ created the heavens and the earth. So good to be back. Now I’ve got more than one key for typing I can tell you this experience. Enjoy. Concerning the I AM BECOMING, vs I AM I will say this. The early Hebrews wrote for intuitive interpretation more than is the case with modern languages. This is why even scholars cannot agree on the translation of many phrases. The translation in The Immortal was I AM BECOMING THAT WHICH I DECIDE TO BECOME. The word “decide” was not in that original phrase, but many of the early Hebrews received the correct meaning through intuition, something scholars do not use, but the I AM BECOMING wording is compatible with 20th century scholarship. The name of God was written without the vowels for the same reason. They were filled in through the intuition and when the intuition was lost the name of God was lost with it. The first decision was a little like throwing the dice, which created the impulse to be. This impulse pulsated around the first duality which was the possibility of becoming vs. not becoming or eternal pralaya. 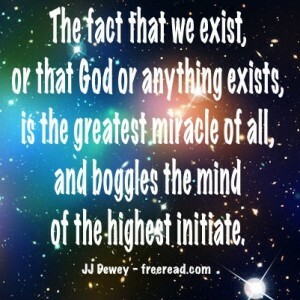 The fact that we exist or that God or anything exists is the greatest miracle of all and boggles the mind of the highest initiate. Our latest discussion on simple things like heroes and the fact that it is difficult to reach harmony on even something so outrageous as to whether Hitler was a hero or not demonstrates the difficulty in reaching oneness as the molecule demands. If we cannot all agree that Hitler was not a hero how will be able to agree on the things of the Spirit? I led us up to the most outrageous item I could think of to see if there would still be disagreement and there was. It did not matter what item I picked. Here were other possibilities that I could have used? Would it be a good thing if a doomsday bomb destroyed half the earth tomorrow? How about all the earth? Is torturing animals for medical advance a good thing? Was Tim McVey really a good guy? Was he a hero as the Oklahoma City bomber? I started with drug addiction, but it wouldn’t matter what I asked. A first grade class would probably be unified on the answers, but not us. We’ve got to not let too much knowledge confuse us. Of course, we all realize that good comes out of evil, but that does not make evil good, it only makes the overall plan good. In other words, evil will come, but don’t let yourself be the agent of it or you’ll regret it. The only path to achieve oneness is to reach the soul together as a group. Only by doing this and being willing to listen to the inner voice will oneness be achieved. Let us sing the Song and renew our attempts at oneness through the soul. There are many more correspondences to Brigham Young and Solomon. The book – Secret Places of the Lion points out two interesting ones. Solomon built the temple “without the sound of a hammer” and Brigham also built the Mormon tabernacle without the sound of a hammer because he had no nails at the time. He also built a good portion of the Salt Lake temple without a hammer. Lions are often mentioned in relation to Solomon and had statues of them in the temple. Brigham was also associated with lions. His house was called the “Lion House” and the members called him the lion of the Lord. Brigham loved Riddles and so did Solomon. If you read his writings and then read the Proverbs of Solomon in the Bible you will pick up a similar intelligence and vibration. Keith is right. Disciples and initiates often do make mistakes, sometimes big ones as did Count Alessandro Cagliostro. One of the differences between them and ordinary humans is that they move forward into action at the risk of making mistakes. If one’s heart is pure there is no need to worry. When the mistakes are revealed they will be corrected.